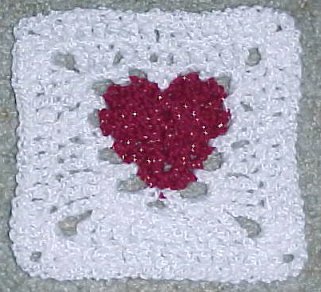 This square is the perfect size to join for a scarf or a baby afghan. You can make a full size afghan if you like smaller squares. R1: With CC, Ch6, sc in 2nd ch from hook. Hdc in next ch. Dc in next ch. (5tr, dc, sl st, dc, 5tr) in last ch. R2: Join MC (white) in center top st of heart. Sc in same st. Ch3. Sk next st. * (Sc, ch3) in next st. Sk next st. Rep from * 4 times. (Sc, ch3, sc) in bottom point of heart. Ch3. Sk next st. * (Sc, ch3) in next st. Sk next st. Rep from * 3 times. Sc in same st as 1st ch. Sl st in 1st sc to join. R3: Ch3, 2dc in next ch sp. (3dc, ch2, 3dc) in next ch sp. 2dc in next 2 ch sps. (3tr, ch2, 3tr) in next ch sp. 5dc in ch sp at bottom point of heart. (3tr, ch2, 3tr) in next ch sp. 2dc in next 2 ch sps. (3dc, ch2, 3dc) in next ch sp. 2dc in next ch sp. Join with sl st in top of beg ch3. R4: Ch3, dc in ea st around placing (3dc, ch2, 3dc) in ea corner ch sp. Join with sl st.